Interest The carbon tax is due to come into force on 1 June 2019, and will mean an extra cost for South Africa’s energy-intensive businesses. But there is a way to minimise the pain and at the same time cut your energy costs. It is the 12L energy efficiency tax incentive. While the carbon tax is the stick to force companies to cut their energy use, the 12L incentive is the carrot. In announcing the amendment to section 12L of the Income Tax Act that came into effect in November 2013, the Government stated that it had become necessary to promote the efficient utilisation of energy, to safeguard the continued supply of energy, and to combat the adverse effects of greenhouse gas emissions – related to fossil fuel-based energy use – on climate change. South Africa has signed up to climate change mitigation, but this will not happen by itself. There have to be active policies and measures to make it happen. As well as the carbon tax, Government explained that “energy efficiency saving” may be considered as a potentially successful method to guarantee the efficient utilisation of energy. The incentive was put in place even before the oft-delayed carbon tax is to happen. However, the expectation is that once cash starts pouring in to the fiscus from the carbon tax, there will then be more funds available for the incentive. One snag with this is that the carbon tax receipts are not ring-fenced. This means that even though they say that the section 12L incentive is part of the revenue recycling initiative Government may – and probably will – be tempted to spend some of the cash on other urgent priorities. Section 12L of the Income Tax Act became effective in November 2013, with amendments effective from March 2015. The 2015 amendments included an increase in the tax allowance from 45c/kWh to 95c/kWh. Companies can claim savings for an individual project or for a combination of projects. The improvement of energy use across all energy sources potentially qualifies for a tax allowance. The regulations for section 12L of the Income Tax Act set out the process and methodology for claiming an allowance for energy savings. A baseline (benchmarking) model and report must be compiled and submitted to the South African National Energy Development Institute (SANEDI) for approval. The baseline model determines what the energy use would have been if the energy savings measures (ESMs) were not implemented. Once the baseline is approved, the energy performance assessment report must be compiled which demonstrates the energy savings for the assessment year. The baseline and performance assessment must be conducted by a certified measurement and verification professional (CMVP) performing measurement and verification (M&V) activities under the auspices of a South African National Accreditation System (SANAS)-accredited M&V body. It needs to be established whether the company has implemented projects or changes that would result in qualifying energy savings to enable it to claim a tax allowance under section 12L of the Act. A project could include a single initiative or numerous initiatives implemented at the facility. The savings of numerous initiatives could typically be quantified with a whole facility approach where all initiatives are grouped together and defined as one project. The firm must engage with a SANAS-accredited M&V body that will perform the M&V activities according to the national M&V standard (SANS50010). The M&V body will then develop the baseline model and report to the SANEDI panel, which will assess the baseline model. If all goes to plan, SANEDI will then approve the baseline model. The M&V body will then measure the energy performance and prepare a performance assessment report. It will then submit the performance assessment report to SANEDI for approval. 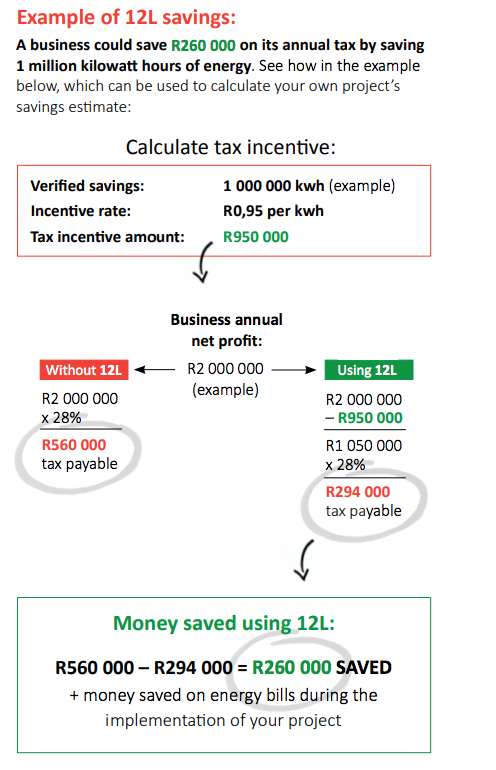 SANEDI will issue a section 12L Energy Efficiency Tax Certificate (the “tax certificate”) for the project. This is a highly detailed, technical and thorough process. It needs accuracy, honesty and proper planning. However, the rewards are there and companies, especially those which are high energy users, are urged to give section 12L serious consideration. The climate change challenge is not going to go away, and if there are tax savings on offer, why not go for them? Can one safely assume these section 12L deductions will be allowed? If you submit a thorough, honest and credible application, there is a good chance you will secure a section 12L tax allowance. Sometimes these can even work retrospectively, if an applicant can compile enough historic data. As stated earlier, SANEDI is the body which reviews applications for a section 12L allowance. Once it is satisfied that the report on energy savings is an accurate reflection of actual or imminent energy savings, it should issue the savings certificate. Clear this hurdle – and it is more than just a form-filling exercise – and you can safely assume the deductions will be allowed. However, a further complication which may arise is that SARS also tends to evaluate the projects. You may see technical questions being asked which were already covered by the SANEDI certification process. Is SARS encroaching on SANEDI's turf? And does it have the expertise to do so? This is something we are watching closely. Please click here to complete the quiz. This article first appeared on the January/February 2019 edition of Taxtalk Magazine.